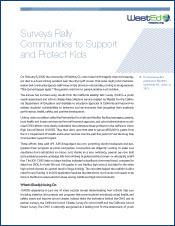 The motivation behind the California Healthy Kids Survey (CHKS) and its partner, the California School Climate Survey, is to give schools a tool to turn troubling statistics into projects and programs that serve students’ emotional, social, health, and safety needs and improve school climate. CHKS is a youth needs assessment and school climate data collection service created by WestEd for the California Department of Education. It’s available to education agencies in California and beyond to address students’ vulnerabilities to behaviors and environments that jeopardize their academic performance, health, safety, and positive development. 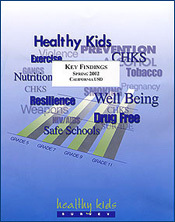 The CHKS is nationally recognized as a leading tool for the assessment of youth resilience and the developmental supports and strengths that have been linked to positive education, social, emotional, and health outcomes. Healthy interpersonal relationships at school are one of the strongest predictors of student academic achievement and teacher career satisfaction. This What Works Brief presents research-based strategies teachers and other school staff can use to build and maintain rewarding relationships with students. This report, prepared by REL West, summarizes findings from a study of the psychometric properties of a key component of the Healthy Kids Survey. The study aims to improve resilience assessment and research so that educators can shape the school environment to promote academic resilience.